We are very excited to be working with Patti Gay and her son Noah. Their collaborations are what make up the Two Can Art Collection. Noah has severe, non-verbal, autism. At 18 months, Patti and her husband began to notice that Noah’s language started to regress, then he began loosing other skills he had previously acquired. With an autism diagnosis, they began creating programs for intensive home therapy. Patti has always strived to fill Noah’s days with activities that help him connect to the world in both a physical and creative way; from hiking and playing outside, to matching games, reading, and of course painting. Patti spends most of her day working with Noah and an instructional aide on teaching Noah independent living skills; sweeping, laundry, shaving, reading recipes, etc. In the midst of it all, they take occasional breaks to spread butcher paper on the kitchen table and paint. 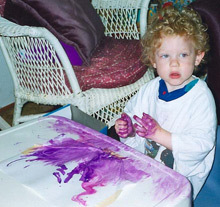 With Patti being an artist herself, having paints in the house and encouraging Noah to explore his own creativity with paints and textures was a natural therapy and something Noah has loved since he was 2. From adding textures like sand or glitter to the paints and varying the means in which Noah paints, whether it be sponges, brushes, or even his fingers, it creates a wonderful sensory activity for him. Patti has saved hundreds of Noah’s paintings over the years. A few years ago she began scanning Noah’s paintings and putting them together to create an amazing collection of images. “I hope that by exposing more people to Noah’s art, they will see that everyone has something beautiful to give the world,” says Patti. “That’s a gift that he’s given to me.” Every image from Two Can Art is created only using Noah’s painted textures. A portion of the proceeds from sale of any Two Can Art images will be donated to help raise Autism Awareness. Click Here to see all of the wonderful images we are currently offering from Two Can Art.